Ayam Golek literally means, rolled around chicken. Something like rotisserie chicken. Pekan is the royal town of Pahang, of which is the current Prime Minister’s hometown. 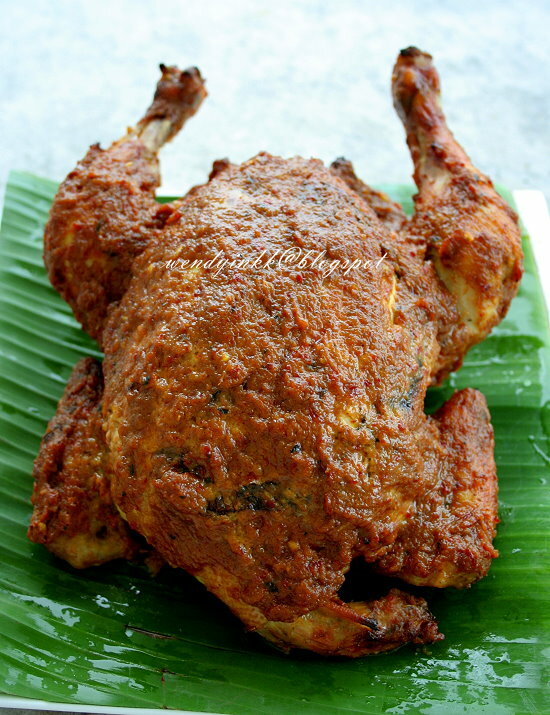 So, this is Pekan’s Rotisserie Chicken. I got this recipe from Pekan Municipal’s website. It’s a recipe from Pahang’s Palace, from the Sultanah’s cookbook. There are lots of recipes there, do visit it and see if there's anything you like. 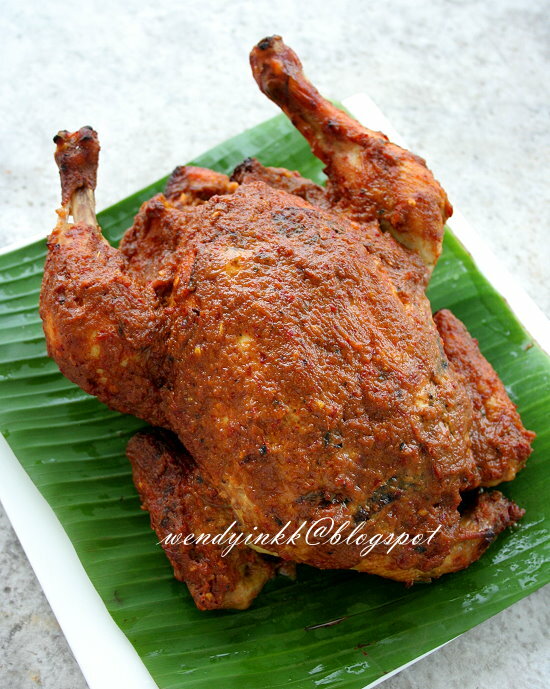 If you like roasted chicken, moist roasted chicken with an aromatic coconutty gravy, do give this a try. It seems like you need to do a few things to get it done, but it’s actually quite easy. With just 4 major steps, don’t talk about peeling and brushing ok. There’s no sautéing, no browning and no spit fire involved. Oh yes, and I didn’t impale the chicken. LOL. The 4 major steps are. 2. Boil the chicken in gravy. 1. Soak tamarind pulp with water for 10 minutes. Rub the tamarind pulp to wash the seeds clean. Strain the tamarind water and discard the remnants. Save the tamarind water. 2. 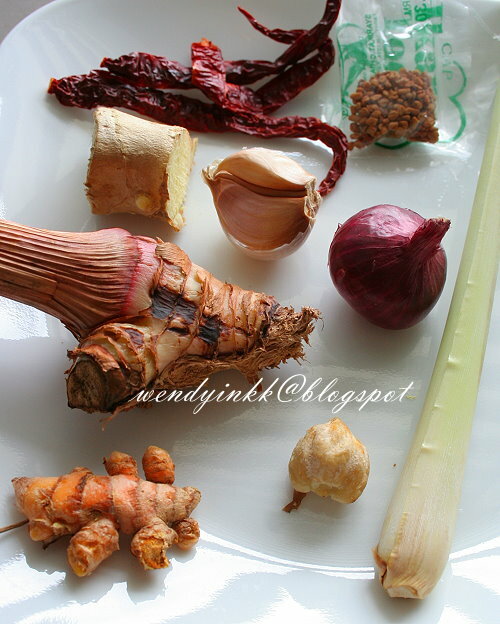 Place tamarind water, shallots, garlic, chilli, galangal, ginger, turmeric and candlenut into a blender and blend until fine. Pour this into a wok. 3. Put lemongrass, fenugreek, coconut milk, 1 cup water, salt and sugar into the wok. Bring to a boil. 4. Place chicken into the boiling gravy (breast side down) and bring to a boil. (gravy should be half way up the chicken, if not add more water) Lower to medium low heat, cover with lid and cook for 15 minutes. Flip the chicken to back side down and cook for another 15 minutes, this time, watching closely so that it doesn’t burn. Bathe the top with gravy and try to scoop some of the boiling gravy into the cavity. 5. Line baking tray with banana leaf (about A4size, can use broken pieces, it’s ok). Remove chicken from the wok, let the gravy drip off and place onto the lined tray. 6. Bake at 180(fan)/200C for 30 minutes (I didn’t preheat the oven) or until the chicken is beautifully golden. 8. Remove chicken from oven and generously brush on the reduced gravy (I brushed 2/3 of the gravy). 9. Return chicken to oven and bake at the same temperature for another 10 minutes. 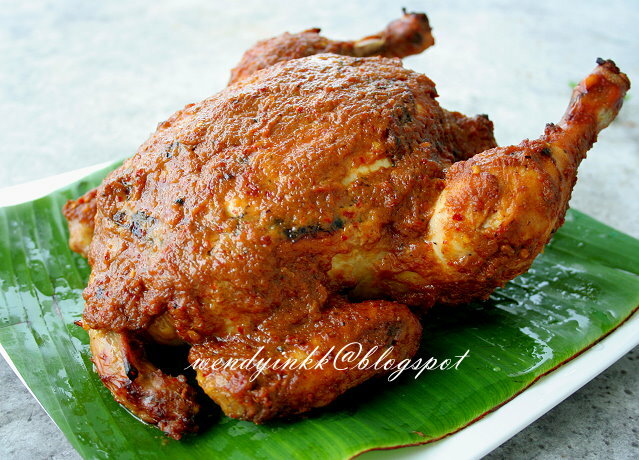 It tasted almost like Ayam Percik, only much much better! 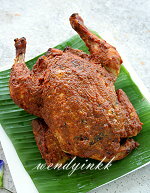 Our household actually hates chicken breast, but this Ayam Golek Pekan has tender juicy breasts : ). It looked just like in the source. Something not usual in roast chicken. Maybe it's due to the boiling. My husband told me to make this again someday, haha, someday I will. How I served it? I didn’t chop it, I don’t want to mess with the baked gravy coating. I broke the limbs with scissors and placed them whole on the serving platter. Tore the breast out and thickly shredded it. And I placed the remaining gravy next to the shredded breast for dipping. I tried marinating the parts for 2 hours, bad move. The chicken flesh turned slightly mushy due to being in contact with the raw ginger and galangal for too long. I never try this method to cook/grill a chicken. Will try it soon. That looks really amazing!! And I can imagine how juicy and tender it is! I might try this with Chicken Marylands instead. I can imagine the taste with all the spices ! .. am I hallucinating or what.... can even smell from the com.... ! The ingredients for the paste sounds like can make it as a stand alone sambal. The chicken look so moist and yummy....ngry. Oohhh....so sedapnya! I wish I could try this recipe, but it is a bit hard for me to look for those ingredients......I love this type of chicken so much! without frying the chilli, will it have a raw chilli taste? It won't have a raw smell. If you're using chicken halves, maybe then 15 minutes each half. Also du need to saute the spice paste first? If for a spatchcock chicken do I need to add water to spice paste? 1. Nope, no sauteing as per the original recipe source. 2. 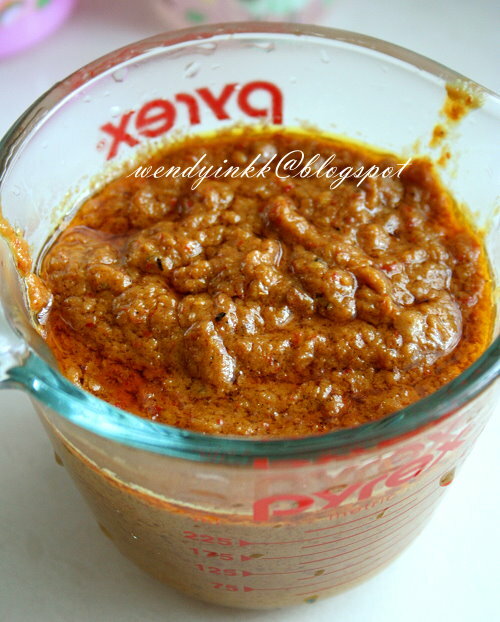 If you prefer to slather on the spice paste and bake, then there's no need to add water. But if you prefer to follow the recipe and boil, bake and apply the reduced gravy, then I suggest you use water as per the recipe.